Customer Service resolved my complaint very quickly and efficiently, and I am very grateful for their help. The 18 x 24 (approx) carpet sample that I spent 30 minutes looking at, was very dense and was exactly what I wanted. When the installers showed up, I was sure they had the wrong carpet. I called Empire and was told to check the tag on the carpet -- it was the same info as the spec sheet. The cable man was here, and said that when he got carpet from the home improvement store, they told him that the carpet would look better once installed over the pad. How I wish I had just told them to leave. Joe Salta, the salesman, was correct: I never mentioned to him that I didn't want carpet that shows every footprint, every vacuum cleaner wheel mark. I am certain that I picked out a good quality carpet that would not make an empty room look messy, as this carpet does. Joe Salta called his manager. For T W O T H O U S A N D M O R E D O L L A R S , they can make this mess go away. Product or Service Mentioned: Empire Today Manager. Review #258799 is a subjective opinion of ReallyanAvatar. 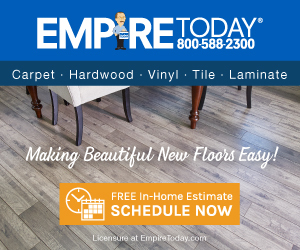 "Empire Today Flooring" Does more damage than good!